February is here, and as Valentine’s Day approaches, love – and fun – is in the air. If you’re hanging out in Brooklyn this holiday, plan to take your ears on a date to check out some of the great events happening around town! What’s love without laughter? If you’re after both, best head to the All-Star Comedy Show at Brooklyn’s historic Kings Theatre. Smokey Suarez hosts a side-splitting lineup featuring Tommy Davison, Aries Spears, Don DC Curry, Mark Curry, Ashima Franklin and Alex Thomas, all in the lush surroundings of the exquisitely restored palace-like venue of the Kings. The deluxe operations of the Nighthawk Cinema have “Valentine’s Day Date” written all over them, offering a mouthwatering dinner menu and full bar available throughout your film (as well as before and after for you more conventional types). On Valentine’s Day proper, they’re pulling out all the stops with a live musical re-scoring of F.W. Murau’s 1927 “Sunrise: A Song of Two Humans” with new music and sound by Morricone Youth. The film, a masterpiece of silent cinema, is part of the Nighthawk’s series of “Love” films, going on all month long. Morricone Youth has been passionately reimagining classic films with new soundscapes, this being their fourth full-length undertaking. Are you sick of a Valentine’s Day laden with chocolates, teddy bears and champagne? New York’s premiere Smiths tribute act, The Sons & Heirs, are basically staging a Valentine’s Day coup by performing their pitch-perfect rendition of the melancholy Manchester group’s live shows. Coupling musical excellence with a well-tuned ear for recreating the cadence and nuance of The Smiths in their prime, The Sons & Heirs are bringing their remarkable show to the Bell House, perhaps on the night that needs them the most. 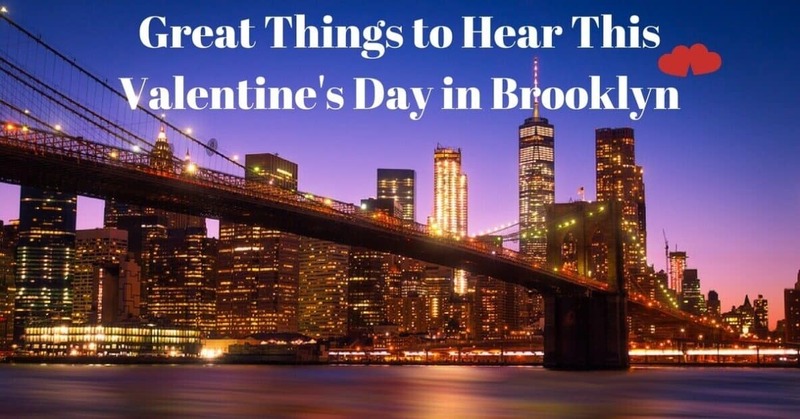 Get in the Valentine’s Day spirit at the annual Brooklyn Music School concert. This year the Vocal Department will be performing a program called “Songs full of Heart” featuring love songs and music that celebrates love and connection. Buffered by dancing and drinking before and after, the annual Cupid’s Undie Run lets you unleash your inner cherub, muster all your cold weather stamina and hit the streets for a jog around the pier. The event keeps your time exposed to the elements mercifully brief – a quick 15 minute “fun run” is the core of the event, but there’s plenty of time both before and after for warmer (indoor) festivities. The run is for a great cause, raising money for neurofibromatosis research. The stars have aligned this February and it’ll feel like they are all in the same room this February, warming you up at the Beacon Theater’s 70s Soul Jam. Performances by Peaches and Herb, The Stylistics, The Emotions, The Blue Notes and Bloodstone are ready to set the mood and make you move. Your hearing is one of the key ways you interact with the world. From the sounds of a romantic concert, to catching the doorbell for a flower delivery, to hearing some sweet nothings whispered in your ear, you don’t want to miss anything this Valentine’s Day because your hearing can’t keep up. When you notice issues with your hearing, it’s important to seek care quickly – and that’s where HeaRite Audiological Care can help. We specialize in testing your hearing for problems and connecting you with smart solutions and effective treatment. Our expert team is here to insure that you are on the pathway to hearing your best, so set up an audio exam appointment today!